Dusty miller is a commonly used as an annual bedding plant. Dusty miller is the common name of several plants with grey or silver leaves. The one commonly used as an annual bedding plant is actually a perennial subshrub native to the Mediterranean. It has been classified as Senecio cineraria, but some taxonomists now regard it as Jacobaea maritima. It is typically grown for its ornamental foliage. Although most references state that it is a tender perennial hardy only in zones 7 or 8-10, I have two plants that have survived two consecutive winters on the edge of zone 4 and 5 and I have read other reports of it surviving zone 4 winters. It is more likely a half-hardy perennial, with some types that are more cold tolerant than others. The leaves are covered with fine hairs giving a felted or wooly appearance, which changes when wet (R). Some cultivars have highly dissected leaves. cut with numerous lobes, many times appearing pinnately compound. Cultivars vary tremendously in the amount of dissection from just slightly sinute to an almost lace-like appearance, offering a wide range of medium to fine textures. Many cultivars offer a fine texture to contrast with other plants. Plants can grow up to 2 feet tall and as wide, but rarely achieve that stature when grown as an annual. When grown as an annual it normally forms a rounded mound 8-15 inches tall. After the first year dusty miller will bloom, producing yellow or cream composite flowers in terminal clusters. The ray flowers are highly reduced and the flowers are not particularly ornamental. Some cultivars do not flower and many gardeners prefer to remove any flowers as they can detract from the foliage. Seeds are produced in cylindrical achenes. Buds (L) and flowers (R) of blooming dusty miller (CL). 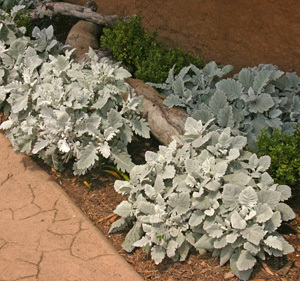 Dusty miller is heat and drought tolerant. 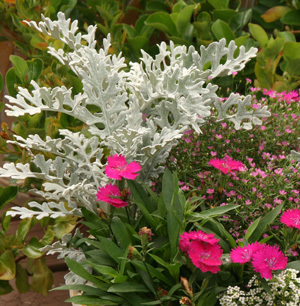 Being of Mediterranean origin, dusty miller is heat and drought tolerant and does best in full sun. It will it become leggy when grown in shade. Although it performs best in moist, well-drained, moderately rich soils, it is tolerant of poor soils. It will last past the first frost, but the leaves die back when temperatures are consistently below freezing. Plants that survive the winter will die back to the crowns, and vigorous new growth will emerge in late spring, so the dead foliage should be cut back in fall or late winter. 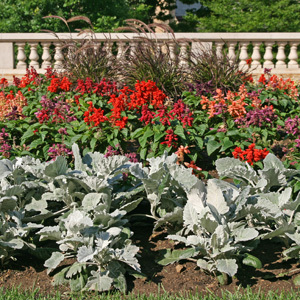 Most people purchase dusty miller as bedding plants, but they can also be grown from seed or cuttings. Take tip cuttings from semi-hard wood in the summer. This plant has few pests and is not favored by deer. 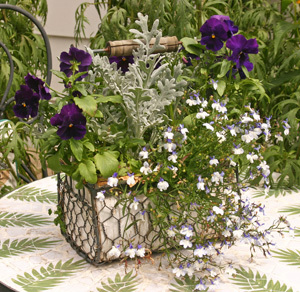 Dusty miller as an accent in a container planting. 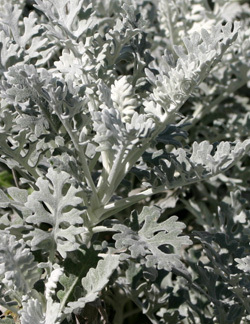 Dusty miller is a great complimentary foliage plant for flowering annuals in sunny sites. Use it as an accent plant in containers, as an edging, in borders or mixed plantings as a contrast for darker flowers or foliage. It combines well with other annuals, especially those that bloom in shades of pink, magenta, or violet. Or mix it with other foliage plants, such as the deep purple Purple Heart (Tradescantia pallida) for season-long color and contrast. They are also good in “moon gardens” as their foliage reflects moonlight. 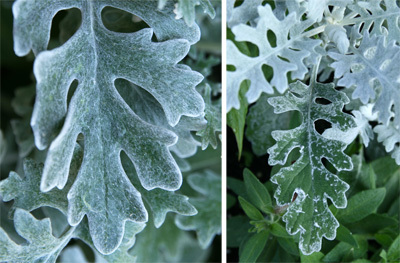 Dusty miller is grown for it ornamental foliage. It is a tender perennial hardy in zones 7 or 8-10. Some people in zone 4 have been lucky to have it winter over. It usually grows 8-15 inches tall. Dusty miller is very heat and drought tolerant.